More than 300 oil and debris skimmers built to the designs of the Institute operate successfully at many ports worldwide, which attests to a high level of our developments and the effectiveness of these skimmers. The analysis of results of oil removal by oil recovery vessels equipped with various reception facilities of adhesion, absorption, and weir types has made it possible to conclude that the most effective are vessels with a weir type reception facility. Only the skimmers of this type can remove without restrictions oil mixed with floating debris, which is often the case under most oil spill cleanup operations, especially in ports. An exceptionally important feature of our skimmer is its unique capability to draw up a contaminated surface layer of water and floating debris to the reception facility from a significant distance, thereby removing the accumulations of contaminants from under the wharves and other inaccessible places. This is achieved by maintaining the difference in the levels in the reception bath and at the weir. As a result the contaminated surface layer like a blanket is smoothly and steadily drawn up and discharged into the skimmer's bath where the separation of collected oil and debris already takes place. The design of our skimmer has received high appraisal as a result of trials at the OHMSETT model tank facility in the USA and by the award in 1989 from the International Seatrade Organization as an acknowledgement for the best environmental equipment for countering marine pollution. These evaluations proved to be correct in all the ports that employ our skimmers. Taking into account the needs and wishes of skimmer operators and striving to improve the methods of cleaning the port body of water of pollution the Institute's specialists have developed a new modification of the design. The skimmer of new generation has retained the basic principle of oil recovery proved by the operational experience from hundreds of ODSs over dozens of years. At the same time substantial improvement of technical characteristics and the expansion of technological capabilities have been introduced into the new skimmer. This was made possible due to the new and innovative approach that our specialists have found in ship design. 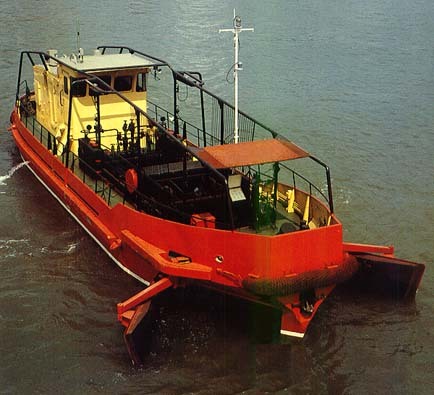 The new skimmer modification Design 50200 is a single-deck vessel with the engine room and wheelhouse located fore, the tanks for recovered oil in the midship and the reception facility for oil recovery aft. The bow end of the hull of the new oil and debris skimmer has now a conventional configuration that creates no longer an excessive resistance on passage. Such a design solution makes it possible now to perform oil recovery when running and maneuvering astern under the influence of the axial-flow pump and screw used as a water-jet propulsor with a rotating nozzle. 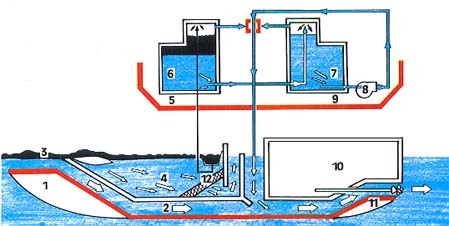 Passage to oil spill sites and other movements on considerable distances the skimmer performs by running bow ahead using conventional propeller screws having higher efficiency than that of the water-jet propulsor, which is very important when operating on currents, in straits and estuarine ports. The speed of the skimmer on passage is increased from 5.5 to 9 knots. The capacity of the tanks for recovered oil is increased two-fold and reached 40 cu.m. The tanks are equipped with a heating system, which facilitates the reception and discharge of viscous oil products. Improved is the system for cleaning entrained water that gets into the reception facility with the recovered oil. The vessel is equipped with a 320 kg hydraulic crane for handling operational oil booms and light floating means for oil patch containment. The hydraulic system enables to use any additional self-contained portable oil recovery means used to respond to oil spills The additional portable equipment can be taken on board together with its attending personnel. The skimmer is equipped with seawater heaters for hosing down oil contaminated hydrotechnical facilities and rocks. The living and working conditions for the crew are significantly improved. The wheelhouse is equipped with a panoramic view, an air-conditioning unit, which is of great importance during prolonged oil spill response operations in the summer period and an improved heating system for winter conditions.